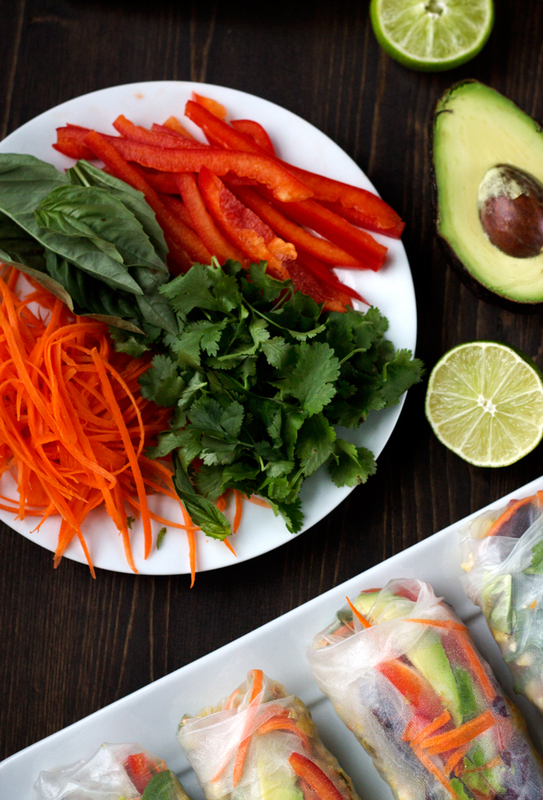 Salad Rolls are the perfect definition of clean food. Super flavorful, colorful and full of veggies and lean protein. They’re also gluten free! Its no secret that we love the flavors of gyoza. If you have been following us, we have posted a recipe for homemade gyoza, gyoza lettuce wraps, and now here is another way to use gyoza type filling. 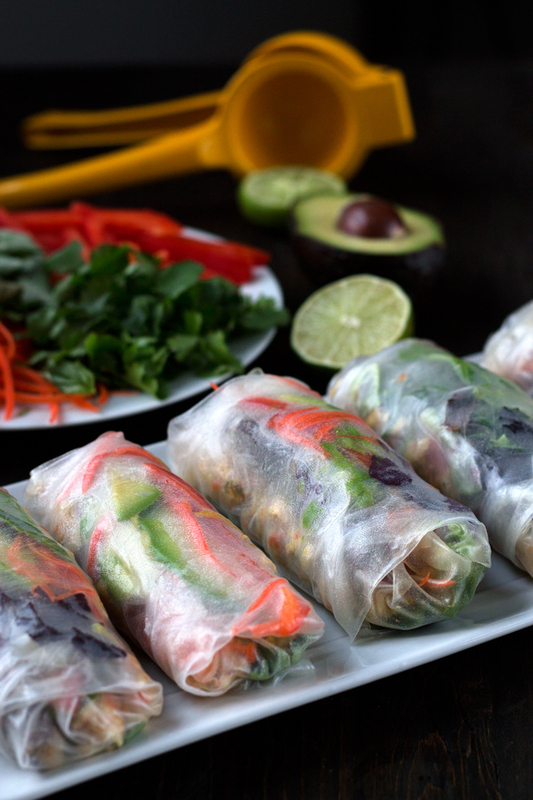 These salad rolls are made with a lightened up filling and lots of veggies all rolled up in a rice paper wrapper. Instead of using pork for the salad rolls filling, we used chicken to cut down on some of the fat content. Lots of salad rolls recipes are made with a peanut dipping sauce, but I have never been a fan of peanut sauce for some reason. Maybe I should try it again sometime because every few years, I find that my taste buds change a bit and I like things that I had never liked before. Do you know what I mean? Anyways, instead of peanut sauce, we made a dipping sauce that is just like our gyoza dipping sauce (which is the best gyoza dipping sauce in the whole wide world, by the way). I will say that it can be a bit tough to dip these rolls in the sauce, just because the ground chicken can fall out pretty easy, but I just spoon some in after the fist bite and then it sinks down throughout the whole salad roll and you get some in each bite. I tried some of these salad rolls with basil, just because I know some people don’t like cilantro and the herbs in these salad rolls make them taste incredibly fresh. Surprisingly, I wasn’t too crazy about the basil, but I imagine some people would like it. I put it in as leaves, but I think it would be better if you chopped it up first and sprinkled it on. 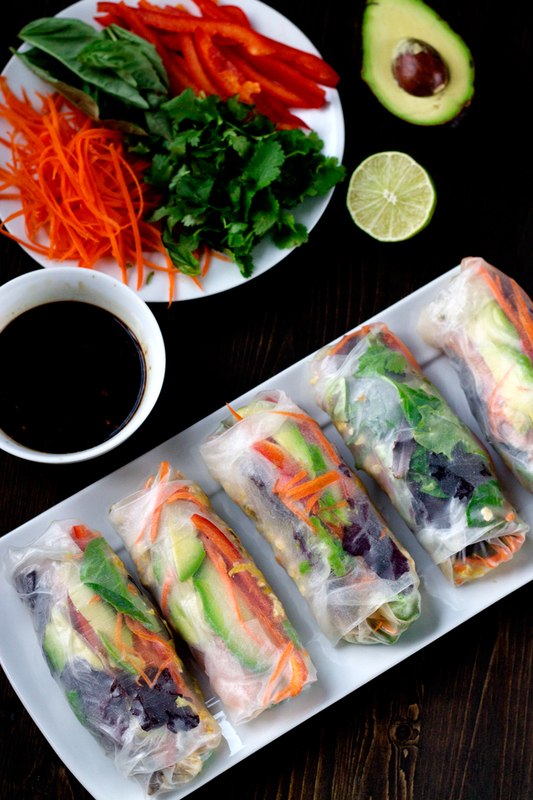 If you’re like me and you are trying to get rid of a little chunk around the waist, OR your just committed to eating clean and healthy, these salad rolls are for you. They are the perfect definition of clean food. Super flavorful, colorful, full of veggies and lean protein. They are also gluten free! I don’t know about you, but I get a little sick of eating salad all the time and although these little rolls have the same ingredients as a salad, somehow they taste different lol. A great way to mix it up a bit. These salad rolls are incredibly portable and easy to pre-make and take for a work lunch or a picnic. They keep well in the fridge for a couple days as long as they are tightly covered in a container or covered with plastic wrap. I even froze a few and ate them later, although like most things, they are best fresh. Heat the oil in a large skillet over medium heat. Cook the ground chicken till its browned and then add the onion, garlic, ginger, carrots and cabbage. Cook until the cabbage is very soft. Season with salt to taste. Put in a bowl. Slice up all your veggies and put them on a plate ready to assemble the wraps. Make the sauce by placing all ingredients into a small bowl and stir. Set aside. Soak a rice paper wrap in warm water till it gets soft. I find that a plate works best for this. Then place the wrap on a flat surface. Put about 1/4 cup of the ground chicken on the wrap, Then top with the veggies. A bit each of the peppers, carrots, cilantro, and avocado. Roll up the wrap by following the instructions on the back of the rice wrapper container. Kinda like a burrito. Fold the one side over the meat and veggies then fold in both sides. Finally roll it up until its all tightly in a package. Keep rolling until all the filling is used up. « Beerskey with Lime. A manly cocktail for game day. 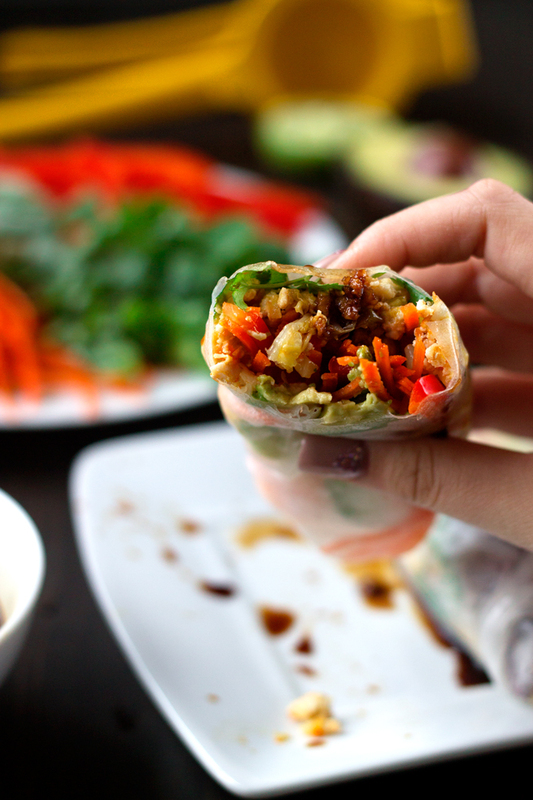 I love how healthy and delicious these rice paper rolls are. Think they would be perfect for lunch or a light dinner this week, thanks for the recipe! Hi Thailia! Thanks 🙂 They definitly are perfect for lunch. Just be careful if you take them to work in a tuperware… Mine stuck together a bit and almost ripped 🙁 If they are too wet and sticky when they go in the container, they will stick together lol. Lesson learned. Hi Julia! Thanks for the comment. Hope you enjoy the salad rolls! I LOVE Salad Rolls! I can’t wait to try this! Mmmmm, I love salad rolls. I’ve never thought to freeze extras. How did freezing affect the texture of the rice paper and veggies? Hi Melinda! Freezing them made the rice paper a bit tougher than fresh and I wouldnt put lettuce, spinach, or avocado in the rolls if you are going to freeze them, that part got wilty. I would freeze them again, just without those ingredients. These look like the perfect finger food for a party. So colorful and healthy at the same time. Yes, I love how colorful these are too! 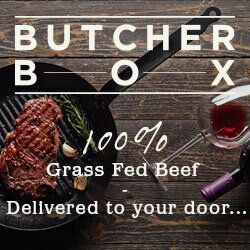 How long would these last in the fridge? I’m thinking of meal prepping them, a week at a time. Hi Megan, I recently tried to do the same thing and I found that after 2 days, the rice paper started to dry out and get tough. I wouldnt recommend preparing them more than 2 days in advance. What is the nutrition info per roll/serving size? Sorry, I dont have that information handy. But I think it would be pretty easy to work it out yourself with a little calorie counting of the ingredients and then dividing by the number of rolls you make. 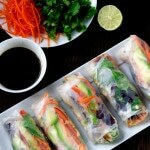 This healthy chicken and vegetable salad rolls are very amazing not only tasty but also healthy. Thanks for adding one more dish in my favorite list.